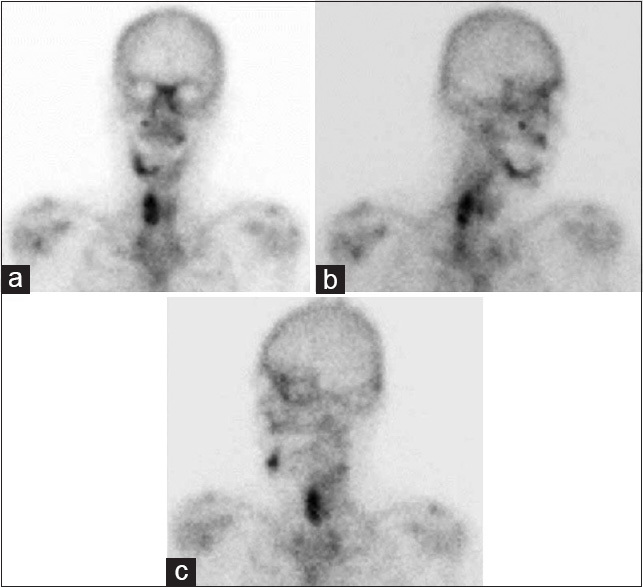 A 75-year-old male, clinically asymptomatic diagnosed case of carcinoma prostate since 2000 has had a radionuclide bone scan with 740 MBq of 99m Tc-methylene diphosphonate ( 99m Tc-MDP) for disease surveillance. Delayed spot images showed an elongated area of abnormal tracer uptake over right thyroid bed mimicking a thyroid lobe [Figure 1]. There was also evidence of degenerative changes over right shoulder, mid-cervical region on the left side and focal uptakes over right body of mandible and upper jaw due to associated dental infections. No gastric or salivary glands tracer uptake suggestive of free pertechnetate due to inadequate labeling was noted. Subsequently, a computed tomography scan was performed which revealed ossification of right anterior longitudinal ligament (OALL) involving (C4-T1) with fractures and associated pseudo-articulations [Figure 2]. There was no evidence of ossification of posterior longitudinal ligament (OPLL) and spinal stenosis. OALL is scarcely described in the literature as it is rarely symptomatic and dysphagia being the most common complication. , OPLL with radiculopathy is more common entity than OALL. OALL is most commonly seen in the thoracic spine followed by cervical and lumbar regions. In this case, it was found on the right side which is postulated to be due to the protective effect of the pulsatile aorta on the left of the thoracic spine. Uptake of 99m Tc-MDP by the OALL over lower cervical and upper dorsal spine could create a diagnostic conundrum and must be included in the differential diagnosis of abnormal radiotracer uptake over thyroid bed in a bone scan. McCafferty RR, Harrison MJ, Tamas LB, Larkins MV. Ossification of the anterior longitudinal ligament and Forestier's disease: An analysis of seven cases. J Neurosurg 1995;83:13-7. Epstein NE, Hollingsworth R. Ossification of the cervical anterior longitudinal ligament contributing to dysphagia. Case report. J Neurosurg 1999;90:261-3. Choi BW, Song KJ, Chang H. Ossification of the posterior longitudinal ligament: A review of literature. Asian Spine J 2011;5:267-76. Resnick D, Shapiro RF, Wiesner KB, Niwayama G, Utsinger PD, Shaul SR. Diffuse idiopathic skeletal hyperostosis (DISH) [ankylosing hyperostosis of Forestier and Rotes-Querol]. Semin Arthritis Rheum 1978;7:153-87.